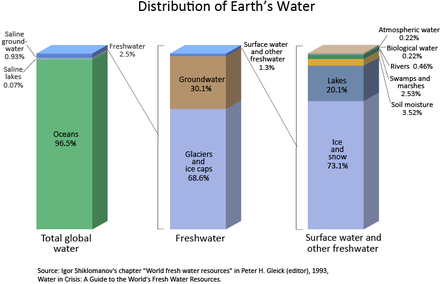 Understand the distribution of Earth's water around the world. Describe the anatomy of a stream and it's components. Explain what a divide is and how it influences streams. Analyze and describe the importance and functions of wetlands. Describe the impacts of floods. Determine the influence groundwater has on fresh water around the planet. Describe the significance of the Earth's oceans. Earth’s oceans contain 97% of the planet’s water, so just 3% is fresh water, water with low concentrations of salts. Most fresh water is trapped as ice in the vast glaciers and ice sheets of Greenland. A storage location for water such as an ocean, glacier, pond, or even the atmosphere is known as a reservoir. A water molecule may pass through a reservoir very quickly or may remain for much longer. The amount of time a molecule stays in a reservoir is known as its residence time. Water is the only substance on Earth that is present in all three states of matter – as a solid, liquid or gas. Along with that, Earth is the only planet where water is present in all three states. Because of the ranges in temperature in specific locations around the planet, all three phases may be present in a single location or in a region. The three phases are solid (ice or snow), liquid (water), and gas (water vapor). Because Earth’s water is present in all three states, it can get into a variety of environments around the planet. 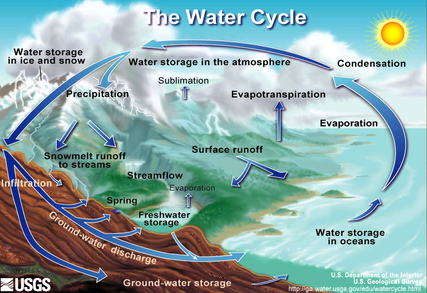 The movement of water around Earth’s surface is the hydrologic (water) cycle. The Sun, many millions of kilometers away, provides the energy that drives the water cycle. Our nearest star directly impacts the water cycle by supplying the energy needed for evaporation. Most of Earth’s water is stored in the oceans where it can remain for hundreds or thousands of years. The oceans are discussed in detail in the chapter Earth's Oceans. Water changes from a liquid to a gas by evaporation to become water vapor. The Sun’s energy can evaporate water from the ocean surface or from lakes, streams, or puddles on land. Only the water molecules evaporate; the salts remain in the ocean or a freshwater reservoir. The water vapor remains in the atmosphere until it undergoes condensation to become tiny droplets of liquid. The droplets gather in clouds, which are blown about the globe by wind. As the water droplets in the clouds collide and grow, they fall from the sky as precipitation. Precipitation can be rain, sleet, hail, or snow. Sometimes precipitation falls back into the ocean and sometimes it falls onto the land surface. This animation shows the annual cycle of monthly mean precipitation around the world. A significant amount of water infiltrates into the ground. Soil moisture is an important reservoir for water. Water trapped in soil is important for plants to grow. Water may seep through dirt and rock below the soil through pores infiltrating the ground to go into Earth’s groundwater system. Groundwater enters aquifers that may store fresh water for centuries. Alternatively, the water may come to the surface through springs or find its way back to the oceans. Plants and animals depend on water to live and they also play a role in the water cycle. Plants take up water from the soil and release large amounts of water vapor into the air through their leaves, a process known as transpiration. NASA has an excellent online guide of the hydrologic cycle. People also depend on water as a natural resource. Not content to get water directly from streams or ponds, humans create canals, aqueducts, dams, and wells to collect water and direct it to where they want it. The table above displays water use in the United States and globally (Estimated Use of Water in the United States in 2005, USGS). It is important to note that water molecules cycle around. If climate cools and glaciers and ice caps grow, there is less water for the oceans and sea level will fall. The reverse can also happen. Fresh water in streams, ponds, and lakes is an extremely important part of the water cycle if only because of its importance to living creatures. Along with wetlands, these fresh water regions contain a tremendous variety of organisms. Streams are bodies of water that have a current; they are in constant motion. Geologists recognize many categories of streams depending on their size, depth, speed, and location. Creeks, brooks, tributaries, bayous, and rivers might all be lumped together as streams. In streams, water always flows downhill, but the form that downhill movement takes varies with rock type, topography, and many other factors. Stream erosion and deposition are extremely important creators and destroyers of landforms and were described in the Erosion and Deposition chapter. Oddly enough, there are a variety of different types streams. A stream originates at its source. A source is likely to be in the high mountains where snows collect in winter and melt in summer, or a source might be a spring. A stream may have more than one sources and when two streams come together it's called a confluence. The smaller of the two streams is a tributary of the larger stream. A stream may create a pool where water slows and becomes deeper. The point at which a stream comes into a large body of water, like an ocean or a lake is called the mouth. Where the stream meets the ocean or lake is an estuary. The mix of fresh and salt water where a river runs into the ocean creates a diversity of environments where many different types of organisms create unique ecosystems. Rivers are the largest types of stream, moving large amounts of water from higher to lower elevations. 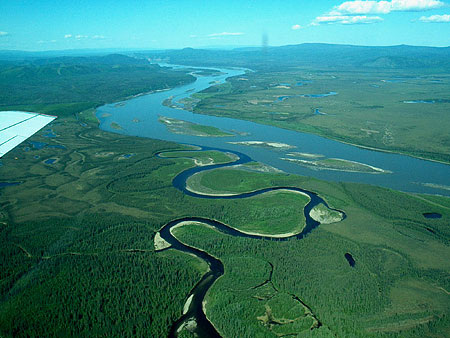 The Amazon River, the world’s river with the greatest flow, has a flow rate of nearly 220,000 cubic meters per second! People have used rivers since the beginning of civilization as a source of water, food, transportation, defense, power, recreation, and waste disposal. A divide is a topographically high area that separates a landscape into different water basins. Rain that falls on the north side of a ridge flows into the northern drainage basin and rain that falls on the south side flows into the southern drainage basin. On a much grander scale, entire continents have divides, known as continental divides. Ponds and lakes are bordered by hills or low rises, so that the water is blocked from flowing directly downhill. Ponds are small bodies of fresh water that usually have no outlet; ponds are often are fed by underground springs. Lakes are larger bodies of water. Lakes are usually fresh water, although the Great Salt Lake in Utah is just one exception. Water usually drains out of a lake through a river or a stream and all lakes lose water to evaporation. Large lakes have tidal systems and currents, and can even affect weather patterns. The Great Lakes in the United States contain 22% of the world’s fresh surface water. The largest them, Lake Superior, has a tide that rises and falls several centimeters each day. The Great Lakes are large enough to alter the weather system in Northeastern United States by the “lake effect,” which is an increase in snow downwind of the relatively warm lakes. The Great Lakes are home to countless species of fish and wildlife. Lakes form in a variety of different ways: in depressions carved by glaciers, in calderas, and along tectonic faults, to name a few. Subglacial lakes are even found below a frozen ice cap. As a result of geologic history and the arrangement of land masses, most lakes are in the Northern Hemisphere. 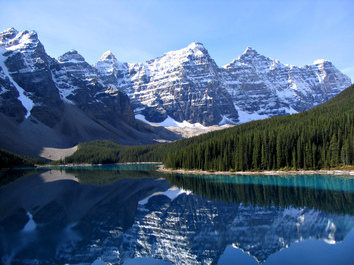 In fact, more than 60% of all the world’s lakes are in Canada — most of these lakes were formed by the glaciers that covered most of Canada in the last Ice Age. Limnology is the study of bodies of freshwater and the organisms that live there. The ecosystem of a lake is divided into three distinct sections: 1) The surface (littoral) zone is the sloped area closest to the edge of the water. 2) The open-water zone (also the photic or limnetic zone) has abundant sunlight. 3) The deep-water zone (also the aphotic or profundal zone) has little or no sunlight. There are several life zones found within a lake. In the littoral zone, sunlight promotes plant growth, which provides food and shelter to animals such as snails, insects, and fish. In the open-water zone, other plants and fish, such as bass and trout, live. The deep-water zone does not have photosynthesis since there is no sunlight. Most deep-water organisms are scavengers, such as crabs and catfish that feed on dead organisms that fall to the bottom of the lake. Fungi and bacteria aid in the decomposition in the deep zone. Though different creatures live in the oceans, ocean waters also have these same divisions based on sunlight with similar types of creatures that live in each of the zones. Lakes are not permanent features of a landscape. Some come and go with the seasons, as water levels rise and fall. Over a longer time, lakes disappear when they fill with sediments, if the springs or streams that fill them diminish, or if their outlets grow because of erosion. When the climate of an area changes, lakes can either expand or shrink. Lakes may disappear if precipitation significantly diminishes. Wetlands are lands that are wet for significant periods of time. They are common where water and land meet. Wetlands can be large flat areas or relatively small and steep areas. Wetlands are rich and unique ecosystems with many species that rely on both the land and the water for survival. Only specialized plants are able to grow in these conditions. Wetlands tend have a great deal of biological diversity. Wetland ecosystems can also be fragile systems that are sensitive to the amounts and quality of water present within them. There are a variety of different types of wetlands. 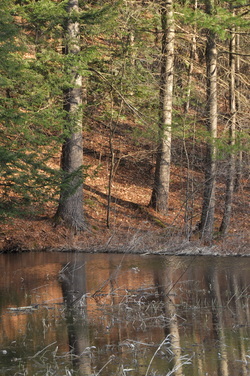 Marshes are shallow wetlands around lakes, streams, or the ocean where grasses and reeds are common, but trees are not. Frogs, turtles, muskrats, and many varieties of birds are at home in marshes. 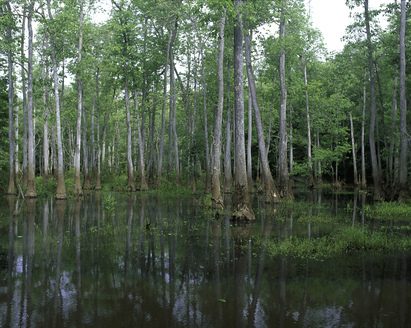 A swamp is a wetland with lush trees and vines found in a low-lying area beside slow-moving rivers. Like marshes, they are frequently or always inundated with water. Since the water in a swamp moves slowly, oxygen in the water is often scarce. Swamp plants and animals must be adapted for these low-oxygen conditions. Like marshes, swamps can be fresh water, salt water, or a mixture of both. 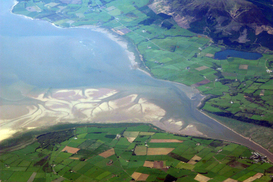 In an estuary, salt water from the sea mixes with fresh water from a stream or river. These semi-enclosed areas are home to plants and animals that can tolerate the sharp changes in salt content that the constant motion and mixing of waters creates. Estuaries contain brackish water, water that has more salt than fresh water but less than seawater. Because of the rapid changes in salt content, estuaries have many different habitats for plants and animals and extremely high biodiversity. As mentioned above, wetlands are home to many different species of organisms. Although they make up only 5% of the area of the United States, wetlands contain more than 30% of the plant types. Many endangered species live in wetlands, so wetlands are protected from human use. Wetlands also offer protection from storm surges from tropical storm systems like hurricanes and provide safe, hidden protection for hatchlings. 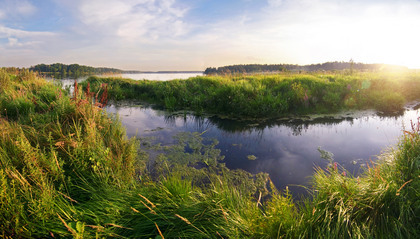 Wetlands also play a key biological role by removing pollutants from water. For example, they can trap and use fertilizer that has washed off a farmer’s field, and therefore they prevent that fertilizer from contaminating another body of water. Since wetlands naturally purify water, preserving wetlands also helps to maintain clean supplies of water. Floods are a natural part of the water cycle, but they can be terrifying forces of destruction. Put most simply, a flood is an overflow of water in one place. Floods can occur for a variety of reasons, and their effects can be minimized in several different ways. Perhaps unsurprisingly, floods tend to affect low-lying areas most severely. Floods usually occur when precipitation falls more quickly than that water can be absorbed into the ground or carried away by rivers or streams. 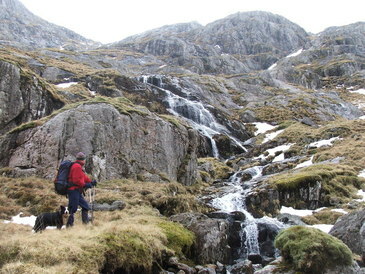 Waters may build up gradually over a period of weeks, when a long period of rainfall or snow-melt fills the ground with water and raises stream levels. Flash floods are sudden and unexpected, taking place when very intense rains fall over a very brief period. A flash flood may do its damage miles from where the rain actually falls if the water travels far down a dry streambed so that the flash flood occurs far from the location of the original storm. Heavily vegetated lands are less likely to experience flooding. Plants slow down water as it runs over the land, giving it time to enter the ground. Even if the ground is too wet to absorb more water, plants still slow the water’s passage and increase the time between rainfall and the water’s arrival in a stream; this could keep all the water falling over a region to hit the stream at once. Wetlands act as a buffer between land and high water levels and play a key role in minimizing the impacts of floods. Flooding is often more severe in areas that have been recently logged. When a dam breaks along a reservoir, flooding can be catastrophic. High water levels have also caused small dams to break, wreaking havoc downstream. 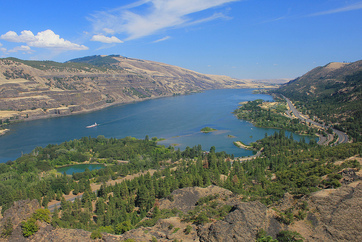 People try to protect areas that might flood with dams, and dams are usually very effective. People may also line a river bank with levees, high walls that keep the stream within its banks during floods. A levee in one location may just force the high water up or downstream and cause flooding there. The New Madrid Overflow in the image above was created with the recognition that the Mississippi River sometimes simply cannot be contained by levees and must be allowed to flood. Not all the consequences of flooding are negative. Rivers deposit new nutrient-rich sediments when they flood and so floodplains have traditionally been good for farming. Flooding as a source of nutrients was important to Egyptians along the Nile River until the Aswan Dam was built in the 1960s. Although the dam protects crops and settlements from the annual floods, farmers must now use fertilizers to feed their crops. 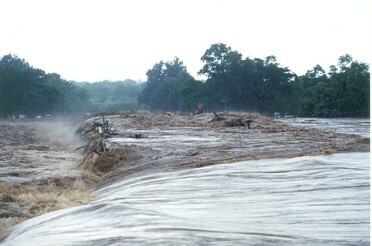 Floods are also responsible for moving large amounts of sediments about within streams. These sediments provide habitats for animals, and the periodic movement of sediment is crucial to the lives of several types of organisms. Plants and fish along the Colorado River, for example, depend on seasonal flooding to rearrange sand bars. Although this may seem surprising, water beneath the ground is commonplace. Usually groundwater travels slowly and silently beneath the surface, but in some locations it bubbles to the surface at springs. The products of erosion and deposition by groundwater were described in the Erosion and Deposition chapter. Groundwater is the largest reservoir of liquid fresh water on Earth and is found in aquifers, porous rock and sediment with water in between. Water is attracted to the soil particles and capillary action, which describes how water moves through a porous media, moves water from wet soil to dry areas. Aquifers are found at different depths. Some are just below the surface and some are found much deeper below the land surface. A region may have more than one aquifer beneath it and even most deserts are above aquifers. The source region for an aquifer beneath a desert is likely to be far from where the aquifer is located; for example, it may be in a mountain area. The amount of water that is available to enter groundwater in a region is influenced by the local climate, the slope of the land, the type of rock found at the surface, the vegetation cover, land use in the area, and water retention, which is the amount of water that remains in the ground. More water goes into the ground where there is a lot of rain, flat land, porous rock, exposed soil, and where water is not already filling the soil and rock. The residence time of water in a groundwater aquifer can be from minutes to thousands of years. Groundwater is often called “fossil water” because it has remained in the ground for so long, often since the end of the ice ages. Th Environmental Protection Agency (EPA) has an animation to help people better understand aquifers. The water droplets are found in the pores between the sediment grains, which is porosity. When the water can travel between ores, that’s permeability. 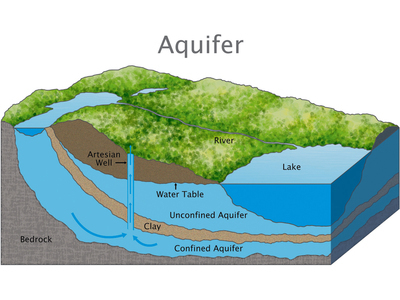 To reach an aquifer, surface water infiltrates downward into the ground through tiny spaces or pores in the rock. The water travels down through the permeable rock until it reaches a layer that does not have pores; this rock is impermeable. This impermeable rock layer forms the base of the aquifer. The upper surface where the groundwater reaches is the water table. For a groundwater aquifer to contain the same amount of water, the amount of recharge must equal the amount of discharge. What are the likely sources of recharge? What are the likely sources of discharge? In wet regions, streams are fed by groundwater; the surface of the stream is the top of the water table. In dry regions, water seeps down from the stream into the aquifer. These streams are often dry much of the year. Water leaves a groundwater reservoir in streams or springs. People take water from aquifers, too. What happens to the water table when there is a lot of rainfall? What happens when there is a drought? Although groundwater levels do not rise and fall as rapidly as at the surface, over time the water table will rise during wet periods and fall during droughts. Click here to view another animation EPA on the water table. One of the most interesting, but extremely atypical types of aquifers is found in Florida. Although aquifers are very rarely underground rivers, in Florida water has dissolved the limestone so that streams travel underground and aboveground. Groundwater is an extremely important water source for people. Groundwater is a renewable resource and its use is sustainable when the water pumped from the aquifer is replenished. It is important for anyone who intends to dig a well to know how deep beneath the surface the water table is. Because groundwater involves interaction between the Earth and the water, the study of groundwater is called hydrogeology. Some aquifers are overused; people pump out more water than is replaced. As the water is pumped out, the water table slowly falls, requiring wells to be dug deeper, which takes more money and energy. Wells may go completely dry if they are not deep enough to reach into the lowered water table. 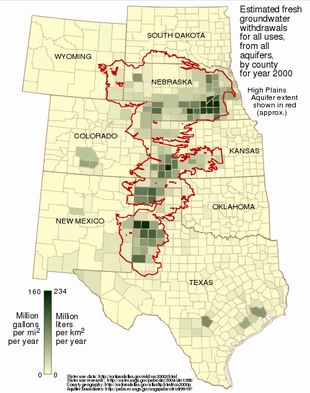 The Ogallala Aquifer supplies about one-third of the irrigation water in the United States. The aquifer is found from 30 to 100 meters deep over about 440,000 square kilometers! The water in the aquifer is mostly from the last ice age. The Ogallala Aquifer is widely used by people for municipal and agricultural needs. About eight times more water is taken from the Ogallala Aquifer each year than is replenished. Much of the water is used for irrigation of crops in the Bread Basket of the central plains. Currently there is great concern about the longterm health of this vast aquifer because it is being tapped into and used at a greater rate than being replenished by natural processes. This could have huge implications in regards to food production in the country if this critical water source is depleted. At current rates of use, 70 percent of the aquifer could be gone by 2050. Click here to learn more. Overuse and lowering of the water tables of aquifers could have other impacts as well. Lowering the water table may cause the ground surface to sink. Subsidence may occur beneath houses and other structures. When coastal aquifers are overused, salt water from the ocean may enter the aquifer, contaminating the aquifer and making it less useful for drinking and irrigation. Salt water incursion is a problem in developed coastal regions, such as on Hawaii. 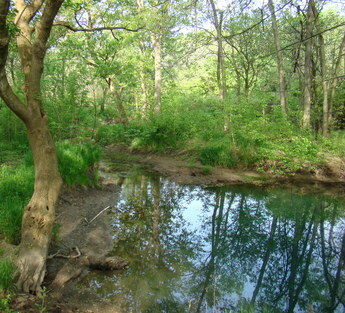 Groundwater meets the surface in a stream, as shown below, or a spring. A spring may be constant, or may only flow at certain times of year. Towns in many locations depend on water from springs. Springs can be an extremely important source of water in locations where surface water is scarce. A well is created by digging or drilling to reach groundwater. When the water table is close to the surface, wells are a convenient method for extracting water. When the water table is far below the surface, specialized equipment must be used to dig a well. Most wells use motorized pumps to bring water to the surface, but some still require people to use a bucket to draw water up. Finally, it's also important to understand how water is cleaned, filtered, and delivered to our homes and work. To many of us do not know where our water comes from and we take it for granted. This often times leads to wasteful water use of our lawns, showers, and other appliances. Again, click here to learn more from the EPA about water is treated before reaching us. The oceans make up 70 percent of the planet and contains 97 percent of all the water on Earth. The vast amount of water stores the majority of the planet's moisture, terrestrial energy, and heat from the Sun. This energy is transferred between the equator and the two poles by larger surface currents by winds and deep ocean currents driven by differences in ocean density. It also provides the moisture and energy for storm systems and ultimately global climates. Phytoplankton, microscopic plants and animals in the oceans provide the foundation of the global food web of species. The earth's oceans are so vital for life that over 40 percent of the world's population live 7.4 billion people near coastal areas. Earth would not be the same planet without its oceans. The oceans, along with the atmosphere, keep Earth's surface temperatures fairly constant worldwide. While some places on Earth get as cold as -7 degrees Celsius and others as hot as 55 degrees Celsius, the range is only 125 degrees Celsius. On Mercury temperatures go from -180 degrees Celsius to 430 degrees Celsius, a range of 610 degrees Celsius. Recall from the chapter on Plate Tectonics that the ocean floor is not flat: mid-ocean ridges, deep sea trenches, and other features all rise sharply above or plunge deeply below the abyssal plains. In fact, Earth’s tallest mountain is Mauna Kea volcano, which rises 10,203 m (33,476 ft.)meters) from the Pacific Ocean floor to become one of the volcanic mountains of Hawaii. The deepest canyon is also on the ocean floor, the Challenger Deep in the Marianas Trench, 10,916 m (35,814 ft). The mapping of the ocean floor and coastal margins is called bathymetry. Water is a polar molecule so it can dissolve many substances such as salts, sugars, acids, bases, and organic molecules. Where does the salt in seawater come from? As water moves through rock and soil on land it picks up ions. This is the flip side of weathering. Salts comprise about 3.5% of the mass of ocean water, but the salt content or salinityis different in different locations. In places like estuaries, seawater mixes with fresh water, causing salinity to be much lower than average. Where there is lots of evaporation but little circulation of water, salinity can be much higher. The Dead Sea has 30% salinity—nearly nine times the average salinity of ocean water. It is called the Dead Sea because nearly nothing can survive within it because of its salinity. Earthquide has an interactive ocean maps can show salinity, temperature, nutrients, and other characteristics. Wind is not the only factor that affects ocean currents. The Coriolis effect describes how Earth’s rotation steers winds and surface ocean currents. Coriolis causes freely moving objects to appear to move to the right in the Northern Hemisphere and to the left in the Southern Hemisphere. The objects themselves are actually moving straight, but the Earth is rotating beneath them, so they seem to bend or curve. Coriolis effect is demonstrated using a metal ball and a rotating plate in this video. The ball moves in a circular path just like a freely moving particle of gas or liquid moves on the rotating Earth. When a surface current collides with land, the current must change direction. In the figure below, the Atlantic South Equatorial Current travels westward along the equator until it reaches South America. At Brazil, some of it goes north and some goes south. Because of Coriolis effect, the water goes right in the Northern Hemisphere and left in the Southern Hemisphere.